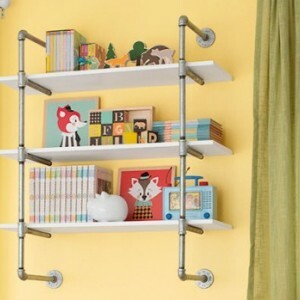 Open Bookshelf, Wall Mounted Bookshelf, Silver Pipe-Frame Complete Pipe Parts Kit for "DIY" Project, Easy to Assemble, SALE!! 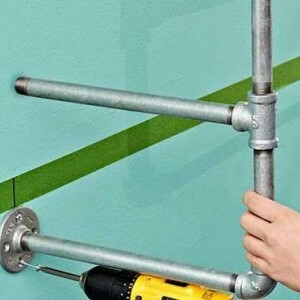 Easy "do it yourself" project for your home or office. 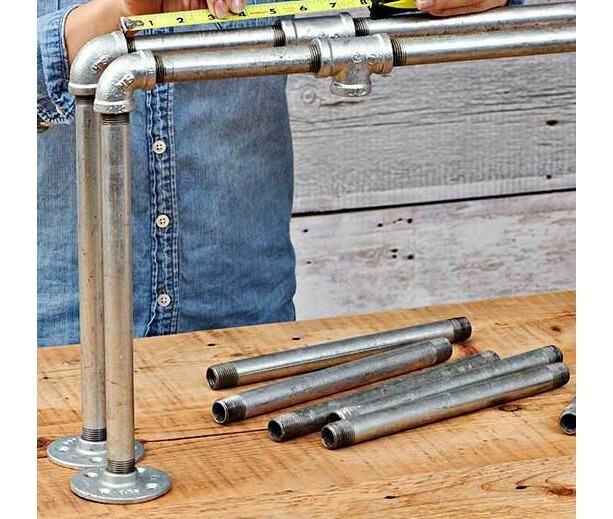 Galvanized (silver color) Pipe-Frame Wall Shelf, Open Bookshelf, Wall Mounted Bookshelf, Complete Pipe Parts Kit for "DIY" Project, Easy to Assemble All of the parts needed (pipes and fittings) to complete this unique open bookshelf system. The shelf boards rest on the brackets and are not fastened in the photo. ***Wood shelves not included with purchase. Fully customizable shelving support system to accommodate shelving from 16" to up 60". You decide how wide you want the Bookshelf System. If you think you'll need more than 2 support brackets I can customize this unit and listing for you, just ask. You can request custom orders if you need 3 or more support shelf brackets (for extra support for units over 60" wide). The shelf boards can be purchased at most lumber yards or big box retailers (Home Depot) very Inexpensively. I don't currently offer the shelving for purchase due to the high expense of shipping these items. Shelf brackets can be spaced more or less depending on thickness of shelf boards and preference of spacing (size of shelf unit). Shelf brackets can hold over 150 pounds if properly fastened into wood wall framing. Sturdy, trendy, and simple. Assemble this three-tier wall shelf in minutes and put it to work today. Materials •	4 - 1/2-in galvanized floor flanges •	4 - 1/2-in x 12-in galvanized pipes •	4 - 1/2-in x 6-in galvanized pipes •	10- 1/2-in x 10-in galvanized pipes •	4- 90 degree fittings •	6- T- fittings ***1-5/8" galvanized mounting screws included with purchase Instructions Step 1 Lay out the pipes and fittings for each shelf frame. 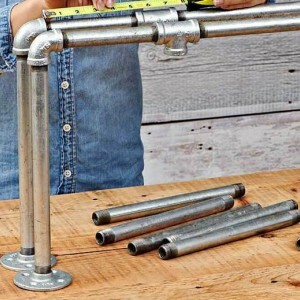 Screw an elbow onto one end of each 12-inch pipe and a floor flange on the other end to make the top and bottom wall extensions for the frames. 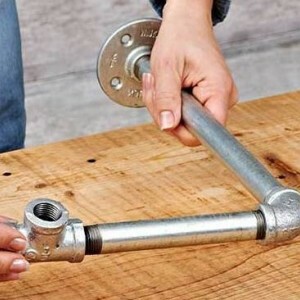 Screw a 6-inch pipe into the elbow connected to the 12-inch pipe. Step 2 Screw one end of a tee to a 6-inch pipe from the assembly in Step 1; then screw a 10-inch pipe into the opposite opening of the tee. 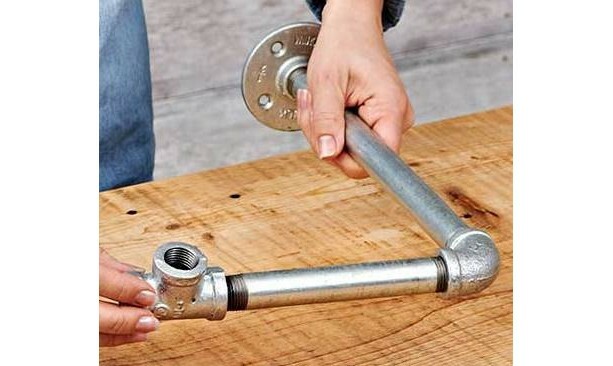 Attach another tee to the end of the 10-inch pipe, followed by another 10-inch pipe and a tee; then repeat. On the other side of the final tee, screw the 6-inch pipe from one of the flange assemblies. The unused openings in all of the tees should be pointed in the direction of the flanges (the wall). Step 3 Set the frames on a bench with the flanges resting flat on the work surface. Align the two frames and then measure between the tees to ensure they are equally spaced. Twist the tees until all the parts align. Step 4 Insert 10-inch pipes in all of the unused openings in the tees. At this point, loosen or tighten the pipes slightly within the tees and elbows so that the 10-inch pipes that will support the shelves are 90 degrees to what will be the vertical pipes. 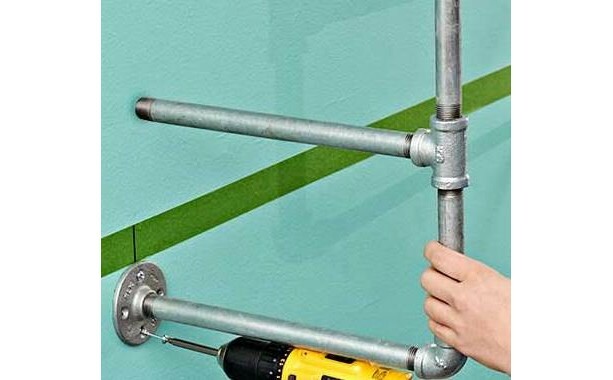 Check them with a square and spacer placed against the pipes as you work. Step 5 Mark a line on the wall using a level and painter’s tape. Mark the wall stud locations on the tape. Mount the frames to the studs so the flanges are even with the tape. Step 6 Center the shelves on the pipes. If they wobble, twist the pipes within the tees until the shelves are stable. 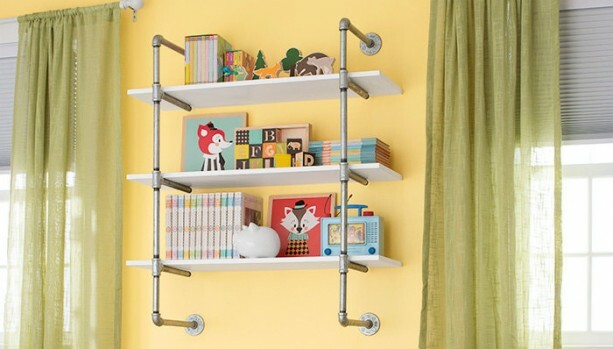 For shelves that will see lots of use or could be accidentally bumped, screw U-shaped pipe straps centered around the pipe supports on the underside of the shelves with 1/2-in roundhead wood screws. ***Complete sssembling of shelving unit is required. This is for "parts only" kit.